Rebels and army forces are engaged in heavy fighting near the city of Goma in eastern Democratic Republic of Congo. The M23 rebels told the BBC that their hill positions had been bombarded most of the night by military planes. 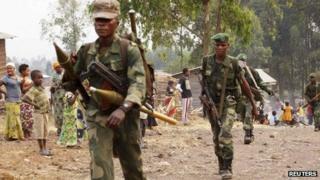 The UN said it was prepared to use "lethal force" to protect civilians if the M23 advanced towards Goma. The fighting comes as its new 3,000-strong intervention brigade to neutralise and disarm the rebels is approaching full strength. If only these two battles were the last of it. But the fighting within eyesight of the major trading city of Goma, and the separate struggles for control near the town of Beni, are almost certainly the tip of an iceberg. When the UN drew up its plan to mount an offensive against all the rebel groups in the east of DR Congo, debate began on who they would go for first. Would it be the Tutsi-led rebels of the M23 movement or the Hutu-led anti-Rwandan government Democratic Front for the Liberation Rwanda (FDLR)? The relatively small anti-Ugandan government rebel group the Allied Democratic Forces were barely part of the discussion. But now the 3,000-strong special UN force may need to deal with it too. There are also dozens of other so-called Mai-Mai militias that sometimes claim a political agenda but are sometimes just criminals. There are many fires for the UN to douse in DR Congo. Last year the rebels pulled out of Goma after briefly seizing the city. Peace talks between the two sides in Uganda have since stalled. Meanwhile, aid agencies say more than 70,000 Congolese refugees have now fled into Uganda following separate clashes in eastern DR Congo near the border on Thursday. A Uganda rebel group based in DR Congo - the Allied Democratic Forces - raided the town of Kamango, which has been since been retaken by the Congolese army. The BBC's international development correspondent Mark Doyle says the widespread fighting illustrates how difficult the task of the new UN offensive force will be. UN peacekeepers are on "maximum alert" to protect Goma as battles continue near the strategic city, the capital of North Kivu province. The frontline is in Mutaho, about 7km (four miles) north of Goma. Both sides accused the other of starting the fighting. The army said it began on Sunday at 15:00 (13:00 GMT) and continued for five hours, resuming again on Monday morning. The M23 says their positions were bombarded all night until 03:00. Government spokesperson Lambert Mende told the BBC Focus on Africa radio programme that army troops had killed at least 100 rebels. The M23 and its main sponsor, Rwanda, had launched the offensive to sabotage the deployment of the UN brigade, he said. The brigade was approaching its full strength, with 70% of troops deployed, Mr Mende added. Rebel spokesman Amani Kabasha said the army had attacked their positions first, with other rebel groups fighting alongside them. He refused to comment on whether there had been any casualties. "What's important is to go back to Kampala to negotiate. We have been there for six months waiting for [President Joseph] Kabila but he refuses to talk to us," he said. The M23 rebels, who like Rwanda's leaders are mainly from the Tutsi ethnic group, mutinied and deserted from the Congolese army in April 2012, forcing an estimated 800,000 people from their homes in the ensuing unrest in the mineral-rich region. A UN report leaked earlier this month says Rwanda is now only providing "limited" support to the M23 rebels and Uganda none at all. Both countries had denied allegations in an earlier UN report that they were arming the group. The BBC's Catherine Byaruhanga in Bundibudgyo, on the Ugandan border with the DR Congo, says many refugees fleeing the ADF attack are staying with Ugandan relatives. A new camp was set up on Sunday, about 8km from Bundibudgyo, for those some of those who have been forced to sleep out in the open without shelter and food, she says. According to the UN, the ADF has recently expanded its military capacity and established links with Somalia's al-Shabab Islamist militants.